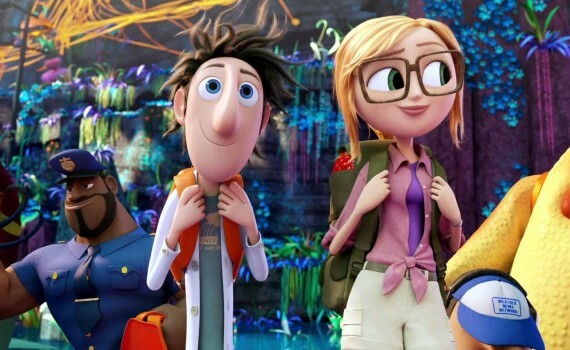 So I watched Cloudy with a Chance of Meatballs and now I’m checking out the sequel. You can read my review of the original and discover that I didn’t like it very much. For lack of a better word, I thought it was dumb. Every comedic choice was the opposite of what I find funny, and I blame Lord & Miller (The Lego Movie, 21 Jump Street, 22 Jump Street) for taking their humor to a kid’s movie and messing up what is potentially an awesome story. I just don’t dig their style, even when I laugh despite myself or applaud what they’re trying to do. They are a bit too in-your-face, and so I was glad to see that they didn’t direct CWACOM2. They’re still credited with the story, but they didn’t oversee the project nor write the screenplay. So here’s hoping that the second is actually better than the first, a rarity but not an impossibility. Spoiler Alert! Flint saved the day. He was able to stop his creation after it lost control and began not only making food storms but also living food, beings who were willing to protect the machine with their lives. But no worries, because the machine is off now, although Flint’s island home is completely covered in goodies. But again, no worries, because Chester V is here to clean up the mess and make the world a better place. He’s a scientist, a philanthropist, and an inventor, the coolest tech mogul around & Flint’s personal hero. So when he tells Flint that his machine is still active deep inside the food jungle that’s covering the island and that it’s producing violent vegetables that want to take over the world, Flint believes him. He’s headed back to his home, ready to stop his invention once and for all, no matter who tries to warn him that all may not be as it seems. Drum roll please…… I actually liked this one much more. Gone was the stupid, stupid humor, here to stay was the cool animation, and introduced to us was a whole cast of crunchy characters that were as awesome as they were incredibly creative. The food had all come to life, they each had their own personality, and it allowed the story to go somewhere it couldn’t in the first film. Also, there was a solid bad guy, someone to root against, and Flint had a team of friends to be his backup buddies. The story was more enjoyable, there was less forced comedy, and it turned out to be the solid kid’s movie I was looking for in the original. The additions of Will Forte & Kristen Schaal were welcome (Last Man of Earth anyone?) and the movie as a whole felt like it was trying less, feeling more, and ready to be no more than what we asked of it; a fun, family film that wouldn’t disappoint.